To experience the Galapagos Islands is to know one of the true gems of the natural world. It feels like you are living a National Geographic television special. The intimacy with the wildlife and the landscape is unparalleled. Our extensive private charter was on a comfortable craft, operated by a professional and friendly crew, and led by a local guide bursting with natural history information. What more could one ask for? Great food, agreeable weather, snorkeling... yep, we had all of that too. We were greeted by fearless birds and mammals right from the start as we boarded the Nemo II at Baltra Island. Our circuitous route touched so many special places: Daphne Major, North Seymour, Floreana, Isabela, Fernandina, Santa Cruz, Espanola, Genovesa, and back to Santa Cruz and Baltra. Specific locations we visited were: Asilo de la Paz, Punta Moreno, Urbina Bay, Tagus Cove, Punta Espinosa, Dragon Hill, Whale Beach, Punta Suarez, Puerto Baquerizo Moreno, Darwin's Bay, Prince Philip's Steps, Cerro Crocker, Los Gemelos, Rancho Primicias, and Punta Ayora. We eventually tallied all of the endemic birds except Mangrove Finch, a species so endangered that access to the only remaining site has been closed. Teasing out the various Darwin's finches became a little clearer by the end of the week thanks to repetition. The seabird show, from storm-petrels to albatross, was simply spectacular. Marine mammals and reptiles rounded out our unforgettable adventure. Three cheers for Captain Carlos and his mighty crew (Mauricio, Robert, Ernesto, and Ivan). Peter Freire, our local guide, was outstanding as well. I want to thank all of you for being such a pleasure to travel with by land, air, and sea. I would gladly do so again in a heartbeat and I hope it happens sooner than later. WHITE-CHEEKED PINTAIL (GALAPAGOS) (Anas bahamensis galapagensis) – We enjoyed excellent looks in the brackish lagoons at Punta Moreno on Isabela Island. The plumage details of this endemic subspecies are a little subdued compared to their mainland kin. 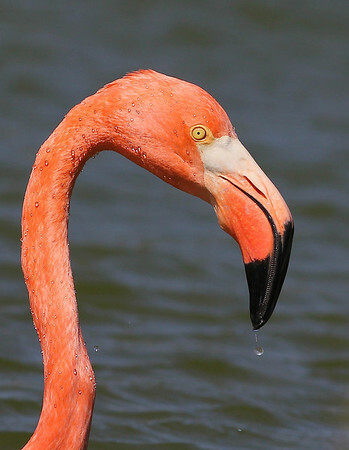 AMERICAN FLAMINGO (Phoenicopterus ruber) – These towering waders are fairly recent colonists to the Galapagos and certainly provided some serious eye candy. We had great looks at Punta Moreno on Isabela Island as well at Dragon Hill on Santa Cruz Island. WAVED ALBATROSS (Phoebastria irrorata) – Our intimate experience in the breeding colony on Espanola Island was magical and earned this species a firm position among the favorite birds of the tour. The entire breeding population is nearly restricted to one island. GALAPAGOS PETREL (Pterodroma phaeopygia) – Never numerous but for those scanning the ocean during our passages, the Galapagos Petrel was a daily occurrence. GALAPAGOS SHEARWATER (Puffinus subalaris) – Wow -- the sheer number of these tubenoses was staggering. ELLIOT'S STORM-PETREL (Oceanites gracilis galapagoensis) – Our constant companions while aboard the Nemo II and a tempting enough photographic target to fill Doug's hard drive. BAND-RUMPED STORM-PETREL (Oceanodroma castro) – Some people picked up a few birds in deeper water toward the end of the tour. The BRSP species complex is a complicated one and with further research, this "Darwin's Storm-Petrel" population is a potential split. WEDGE-RUMPED STORM-PETREL (Oceanodroma tethys tethys) – The sensation of standing among the swarm on Genovesa Island is difficult to put in words. Unlike most species in the Galapagos, the Wedge-rumped Storm-Petrels face serious predation concerns at their breeding site thanks to the Short-eared Owls. RED-BILLED TROPICBIRD (Phaethon aethereus mesonauta) – Never numerous but almost an everyday bird. Our best looks occurred during the panga ride along the cliffs in Darwin Bay at Genovesa Island. MAGNIFICENT FRIGATEBIRD (Fregata magnificens) – The common and widespread frigatebird of the Galapagos. GREAT FRIGATEBIRD (Fregata minor ridgwayi) – A much more uncommon and pelagic-dwelling species in the Galapagos compared to the Magnificent Frigatebird. The subtle plumage differences of the Great Frigatebird were scrutinized on North Seymour and Genovesa islands. 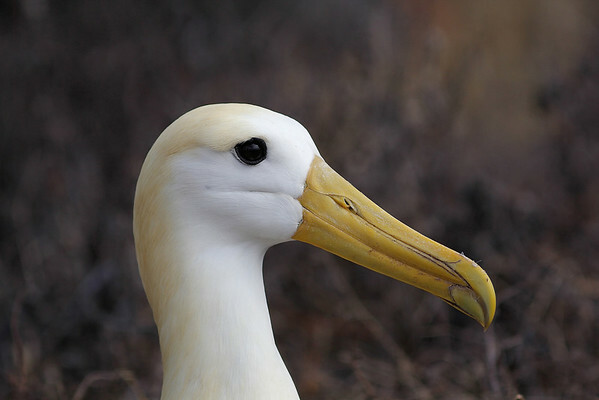 NAZCA BOOBY (Sula granti) – Formerly considered to be a population of the Masked Booby, Nazca Boobies were breeding trail side on Espanola Island. RED-FOOTED BOOBY (EASTERN PACIFIC) (Sula sula websteri) – From white to buff to brown, this variably plumaged booby all show the "painted face" and nest in trees unlike the other two Sulids we encountered. GREAT BLUE HERON (Ardea herodias) – We observed several individuals but none as close as the bird at Punta Espinosa on Fernandina Island. The subspecies restricted to the Galapagos is cognata, in the white form group. GREAT EGRET (Ardea alba) – A few individuals starting with the bird high up the slope on Daphne Major. YELLOW-CROWNED NIGHT-HERON (GALAPAGOS) (Nyctanassa violacea pauper) – Like many of the other species that have a Galapagos subspecies, the YCNH is much darker than its mainland counterparts to match the lava background. PAINT-BILLED CRAKE (Neocrex erythrops) – It was funny to chase these guys as they ran around the small ponds and brush at Rancho Primicias. COMMON GALLINULE (Gallinula galeata) – Our first look was in the brackish lagoon during our hike at Punta Moreno on Isabela Island. AMERICAN OYSTERCATCHER (Haematopus palliatus galapagensis) – We enjoyed great looks at the landings on North Seymour and Espanola. BLACK-NECKED STILT (Himantopus mexicanus) – The brackish lagoon at the Dragon Hill on Santa Cruz Island provided great looks at this long-legged shorebird. WANDERING TATTLER (Tringa incana) – A few individuals have already returned from their northern breeding grounds. BROWN NODDY (Anous stolidus galapagensis) – This was one of the first species to entertain us as we waited to set sail from the dock on Baltra upon arrival. Often they would mix with the Galapagos Shearwaters in a feeding frenzy. DARK-BILLED CUCKOO (Coccyzus melacoryphus) – Nancy did an amazing job of spotting our first buried in a thicket! John keenly picked out our second shortly after Nancy as we circled the "goat hill" at Whale Beach on the west side of Santa Cruz Island. BARN OWL (GALAPAGOS) (Tyto alba punctatissima) – What a way to kick off our list! Peter introduced himself then promptly showed us a roosting bird in the airport. SHORT-EARED OWL (GALAPAGOS) (Asio flammeus galapagoensis) – None of us have seen Short-eared Owls that well before. They were another example of a darker version of their mainland forms. VERMILION FLYCATCHER (GALAPAGOS) (Pyrocephalus rubinus nanus) – This subspecies of the Galapagos has become a very rare bird. Some of the group got on a female on Isabela Island. We also heard a calling bird at Los Gemelos on Santa Cruz Island. YELLOW WARBLER (GALAPAGOS) (Setophaga petechia aureola) – Although they are reminiscent in appearance to the mangrove group of Yellow Warblers, this subspecies is monotypic in a new group. The coastal areas were filthy with this bird at times. GRAY WARBLER-FINCH (Certhidea fusca mentalis) – Unlike the extremely similar and monotypic Green Warbler-Finch, the Gray Warbler-Finch has seven recognized subspecies based on the various islands in which it inhabits. We encountered this subspecies on Genovesa Island. GRAY WARBLER-FINCH (Certhidea fusca luteola) – We encountered this subspecies on San Cristobal Island. GRAY WARBLER-FINCH (Certhidea fusca cinerascens) – We encountered this subspecies on Espanola Island. WOODPECKER FINCH (Camarhynchus pallidus pallidus) – The Woodpecker Finch has three recognized subspecies and we got them all. The pallidus occurs on Santa Cruz Island. We observed one on our walk around Dragon Hill. WOODPECKER FINCH (Camarhynchus pallidus productus) – Productus was the first subspecies we encountered during our hike up from Tagus Cove on Isabela Island. LARGE TREE-FINCH (Camarhynchus psittacula psittacula) – The guides were really starting to sweat this one but we caught up to several at Los Gemelos on Santa Cruz Island the last day thankfully. There are two other subspecies on different islands that are harder to come by. SMALL TREE-FINCH (Camarhynchus parvulus parvulus) – Never numerous but quite widespread, we enjoyed this dainty finch on a number of islands. 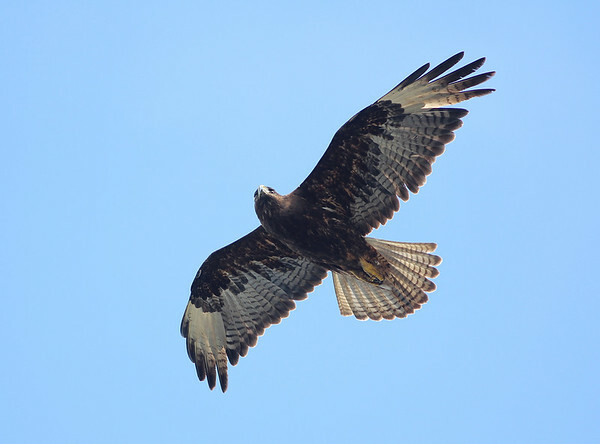 There are two subspecies and this is the one we saw most days. 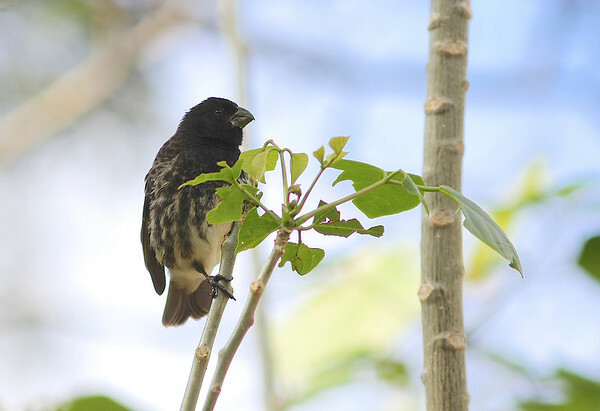 SMALL TREE-FINCH (Camarhynchus parvulus salvini) – This subspecies is restricted to just San Cristobal Island but we got it on our downhill walk. SHARP-BEAKED GROUND-FINCH (Geospiza difficilis difficilis) – One of three subspecies for this bird and the only one we encountered on Genovesa Island. They regularly glean ectoparasites off other residents (bird and reptile) of the Galapagos. The subspecies out on the nutrient-poor islands of Darwin and Wolf have been documented using their pointy bill to wound and drink blood from the backs of boobies. COMMON CACTUS-FINCH (Geospiza scandens intermedia) – There are three other subspecies but all of our sightings on North Seymour, Floreana, and Santa Cruz were of this subspecies. BOTTLENOSE DOLPHIN (Tursiops truncatus) – Several pods put on quite a show for us. The most memorable were the ones we circled repeatedly en route from Daphne Major to North Seymour. SHORT-BEAKED COMMON DOLPHIN (Delphinus delphis) – The feeding frenzy we witnessed in the Bolivar Channel was impossible to count but those leaping cetaceans certainly numbered in the hundreds. FIN WHALE (Balaenoptera physalus) – The four or five individuals surfacing around the boat as we motored from Floreana the second evening were really special. "GALAPAGOS" SEA LION (Zalophus californianus wollebacki) – These charismatic creatures were absurdly tame and all over the place, including the middle of the trails. They don't care to share benches with humans however as John discovered. This is a distinct, resident population of California Sea Lion. 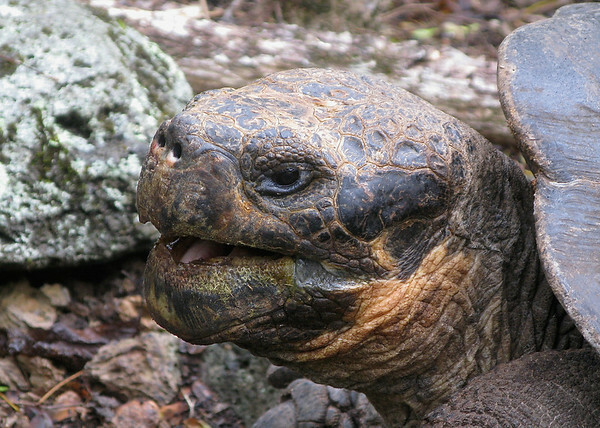 Galapagos Tortoise (Geochelone elephantopus) - There are 14 recognized subspecies but only 11 of them still survive. The subspecies are divided into two groups by carapace shape: saddle and dome. The total population is thought to number around 15,000. Go Diego! Green Sea Turtle (Chelonia mydas) - It is also referred to as the Black Turtle and the Pacific Green Turtle. The "Galapagos Green Turtle" is assigned to the eastern Pacific subspecies agassizi but many would argue that they are a distinct population. More research is needed. We spotted them from the boat frequently and those that snorkeled had many close sightings. Marine Iguana (Amblyrhynchus cristatus) - The only marine iguana in the world whose foraging behavior is unique. 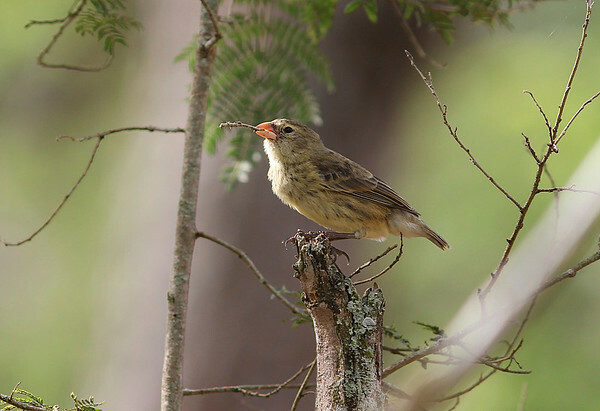 There are seven subspecies scattered around the islands. They are separated from the land iguanas by their head shape and long, laterally compressed tail. We saw them basking in heaps and piles. Land Iguana (Conolophus subcristatus) - The terrestrial iguana of the Galapagos and the chubbiest iguanas I have ever seen. Galapagos Lava Lizard (Microlophus albemarlensis) - The widespread species we noted on Fernandina, Isabela, North Seymour, and Santa Cruz. We saw a number of smaller rays launching out of the water and at least a half dozen large Manta Rays glided under the bow. Sally Lightfoot Crabs (Grapsus grapsus) clung to every rocky shoreline.